Situated beside the Tirthan river in Himachal Pradesh at an altitude of 1600 meters, Tirthan Valley is a gateway to the Great Himalayan National Park. A place where you can easily forget the world to relax, rejuvante and have loads of nature walks following one trail or the other, into the woods or beside the river. In all, it’s an ideal place for connecting with nature, trying out family camping, enjoying with friends over bonfires, sitting beside the river and listening to music, getting together to know each other (helpful in team or relation building ;)), eating out or just lazing around, etc.. The list of such things to do in Tirthan Valley goes on and easily makes it a complete offbeat holiday destination in Himachal. Let’s look at this Tirthan Valley blog guide to help you plan a memorable trip to this quaint place in the Himalayas. How do I get to Tirthan Valley from Delhi? Are you Planing a Honeymoon Trip to Himachal? Tirthan Valley or Banjar Valley are synonymously used for Banjar tehsil located in Kullu district of Himachal Pradesh. Tirthan Valley is located in Banjar town and because the valley has Tirthan river flowing through it, the place is more popular by the name of Tirthan Valley. Jibhi is another known or popular name from Banjar Valley and apart from the small village locations, there isn’t much difference between Banjar or Tirthan Valley or Jibhi. Technically, all three are part of Banjar Valley along with few other nearby villages where Gushaini and Jibhi are the two most popular tourist locations of Tirthan. Some people also refer to Tirthan Valley as Trout Fishing Valley. When you travel to Tirthan Valley, you can right away feel the raw, pure bliss nature with fresh air surrounding you and a cool breeze kissing your face. If nature walks is a thing you like or even trout fishing then don’t think much about your upcoming vacation in Himachal Pradesh but just head over from Delhi to Tirthan Valley. Banjar or Tirthan falls on the alternate route from Kullu to Shimla over Jalori Pass. Hence, you get to enjoy the adventurous drive over Jalori Pass and do the complete circuit as in Manali to Tirthan Valley to Shimla or Mashobra easily in one trip. Being gateway to Great Himalayan National Park, Tirthan Valley is a trekker’s paradise. The valley offers a lot of treks ranging from 2 days to 15 days and these treks are tagged from beginner level to advanced ones. An avid trekker can explore and reach as high as 4000+ meters approximately. Apart from long treks, you can also do day hikes in the woods or nearby waterfall in Tirthan Valley. So, if you plan to do some hiking or trekking with the family or friends and a quiet setting of nature, just drive on the road to Tirthan. Weather in Tirthan remains nice and pleasant most of the year with temperature in summers being less than 24-degree Celsius. There is mostly a presence of cool breeze due to the flowing river. Due to the flowing Tirthan river adjacent to the valley, you will always feel music in the air and lots of greenery around you add to that nice feeling. In winters, the minimum temperature may fall below the freezing point and hence, snowfall is expected during winter. The weather gets dry in peak winter months. Snowfall is expected in January – February months and you can always go for snow at Jalori Pass. Although Tirthan is very nice, quiet, relaxed and pleasant place almost throughout the year. However, during the spring season from March to May, it’s just amazingly refreshing and beautiful. Fully loaded with apple orchards the beauty of Tirthan Valley gets ready to mesmerize any soul on earth. 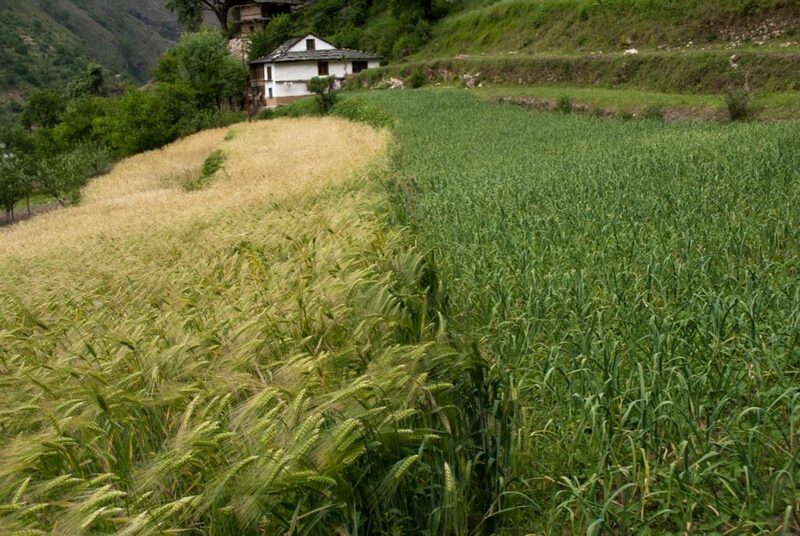 Hence, the best time to visit Tirthan Valley is definitely spring season. Please note that in winters Tirthan gets quite cold and vulnerable towards wildlife interference especially by the presence of Leopards and Bears in this area. The presence of snow at heights forces the wildlife to descend towards the valley. In snow due to less amount of food in the mountains, these leopards and bears are bound to attack, so be careful while having a walk in the woods. Hence, if you are traveling to Tirthan in winters, then it is better to avoid camping or else take wildlife precaution when camping in the wild. As per the past experiences of many people including mine this valley will not disappoint you a bit from March to November months and is considered the good time to visit if somehow you don’t get a chance to visit Tirthan in the spring season. Trout fishing season is from March to October but for that, you also need to take a daily license at Rs. 100 per person per fishing rod which is non-transferable. As Tirthan Valley is located in Kullu region of Himachal Pradesh, you need to take the Delhi to Manali Highway to reach a place called Aut after Mandi. You do not need to enter the Jawahar tunnel at Aut rather continue on the road on the right that takes you into Banjar Valley. If you plan to visit Tirthan from Manali, then start back towards Delhi from Manali via Kullu. After reaching Aut, just after crossing the Jawahar Tunnel, take the left exit. (Caution::- Route is extremely scenic from here on ;)). 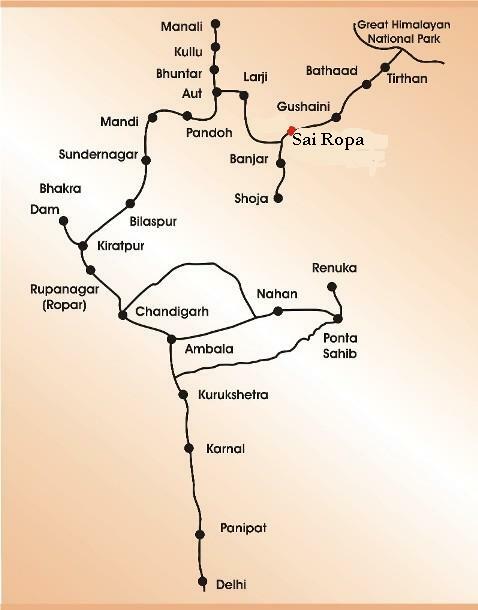 You will reach Larji T-Point from where you need to take a right to reach Sai Ropa. At Sai-Ropa, if you head straight you will reach Banjar – Shoja – Jalori Pass but for Tirthan just follow the U-Turn from there towards Gushaini-Nagni (Tirthan). It will take about 1.25-1.5 hour drive to reach Tirthan villages from Aut junction. Many people are also interest to travel the full circuit from Delhi including Delhi to Manali to Tirthan to Shoja to Jalori to Shimla and back home. 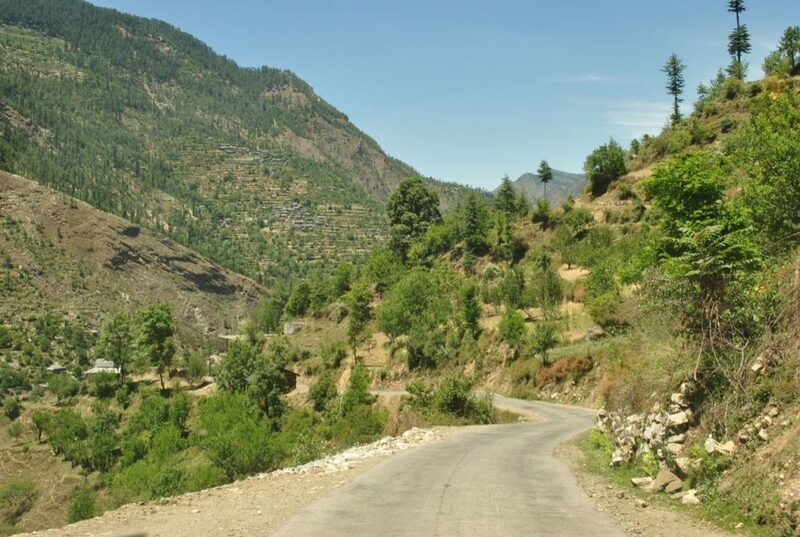 This way you enjoy both routes and visit some beautiful places of Kullu and Shimla districts. The nearest airport from Tirthan Valley is Bhuntar, approximately 50 km away. You will have to take a cab/bus to get to Tirthan from Bhuntar. The airport has limited connectivity and might face interruptions in operations, given weather fluctuations in the Kullu region. Chandigarh is the closest major Railway Station. No direct trains run to Mandi from Delhi or Shimla. However, you can take Shatabdi till Chandigarh and hire a cab/ take a bus till Mandi. You can also travel to Joginder Nagar train station as well which is about 120 km from Tirthan Valley. A lot of people ask me “How do I get to Tirthan Valley by bus?” and in this section, I will provide the details about traveling to Tirthan by public transport. You can travel to Tirthan by bus or public transport easily. Regular HRTC buses, as well as overnight Volvo buses, run from Delhi to Manali every day. These buses reach Aut next morning around 6 AM. You can get down from the bus at Aut and cover the rest of the journey to Tirthan by taxi or wait for Kullu to Shimla bus to arrive. Alternatively, if you are traveling on budget, you can hitchhike from Aut to Tirthan Valley as well. After getting down, you have two choices from Aut, either prebook a taxi with the help of the hotel or guest house from Tirthan Valley or you can get down at Bhuntar to get a taxi yourself. From Aut you can get a taxi for around Rs 800 with a seating capacity of 5-6 people. If you take the taxi from Bhuntar the taxi may charge about Rs 1500 as they might have to go back empty. The prearranged taxi from hotel might be cheaper as the taxi they will send for pickup will be Banjar based taxi, not Kullu or Bhuntar based. Tirthan is about 30 km from Aut. While going back you can catch the Manali to Delhi bus around 7 PM at Aut and reach Delhi next morning by 7 A.M. next morning. Do not forget to mention your pick up point at Aut or Bhuntar when doing the booking of HPTDC Volvo bus. However, when you travel over Jalori Pass from Tirthan to Shimla, the story of climbing and getting down from Jalori Pass is different. If there is rain, the road conditions will be a mess just around Shoja and all the way up to Jalori Pass and further down towards Ani – Khanag villages. The slush will increase the challenge of climbing the steep gradient of Jalori Pass. Even in the absence of rain, the drive from Banjar to Jalori Pass and then down towards Narkanda may give goosebumps at certain points. Make sure to check my must-have things to carry on a self-drive trip to Himachal. Here is a hand sketched map of Tirthan Valley to give you an idea of places around it and where exactly it is located in Kullu region of Himachal. A trip to Tirthan Valley is very much possible as a 3-day long weekend trip. But, to get the feel of this relaxing place in entirety, you can always add one more day to make it 4-5 day trip from Delhi and relax in the lap of nature to refresh yourself inside out. 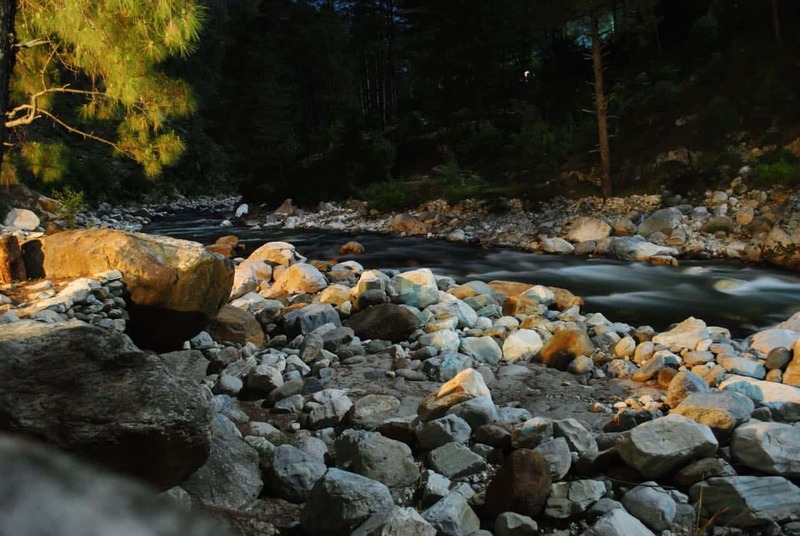 You can also plan to add a drive to Kasol – Manikaran as well or do the complete circuit at ease with a stopover at Narkanda on the other side of Jalori Pass. Leave from Delhi in the evening and reach Gushaini or Banjar early morning on the next day. You can do the journey by overnight Volvos running between Delhi and Manali everyday. Early morning arrival means sound sleep and rest for 5-6 Hours. Then just rest around the serene and calm Tirthan river. Relax for the whole day. In the evening you may enjoy a bonfire. Trek or hike into the Great Himalayan National Park (GHNP) or hike to see nearby waterfalls. There are two of them at little distance to each other. After coming back from the hiking day, enjoy the dinner alongside the river before having a sound sleep. On Day 3, Sunday, you can easily relax till afternoon and then leave for Delhi around 12 PM to reach by 11 PM in the night. This will give you a night of sound sleep and you can join the office easily the next day on Monday. Or if you are traveling by bus, then you will reach next morning and may have to join office a bit tired or fatigued but shall be manageable with the comfort of Volvo bus. Hence, you can see that, yes you can travel to Tirthan Valley over a weekend trip itself. A bit hectic but doable. Well, if you have few more days at hand then you can opt for below days based upon your taste, comfort and time on hands. On this day, you can drive to Jalori Pass and from there you can trek to Serloskar Lake. On the way back you can have a meal at Sringi Vatika, nice homely guest house run by an old couple. The food preparations take some time there but you can always walk down the riverside to have some fun. You can add this day to make it a 4-day trip to Tirthan Valley from Delhi. 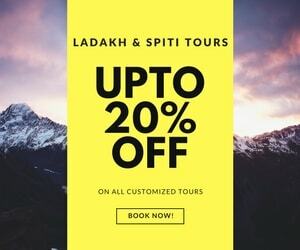 Alternatively, you can also drive from Tirthan to Kasol and Manikaran and either come back to Tirthan same day for a night stay or stay at Kasol only. This way you can leave to Delhi or home from Kasol only without the need to come back to Tirthan unless you plan to take the longer Jalori Pass route. This will also help you plan a 4-day trip to Tirthan. You can of course opt for both days to make a 5 day trip from Delhi. Another Trip Suggestion: You can also plan to include a visit to Prashar Lake as well with Tirthan Valley. Well, to be on the adventurous side on Day 3 of the weekend trip itinerary, you can leave early morning to follow this route and can cover the “Alternate Option Day” with Jalori Pass. However, Serloskar Lake will not be possible in that case. I will always prefer this route either while coming or while leaving from Tirthan. 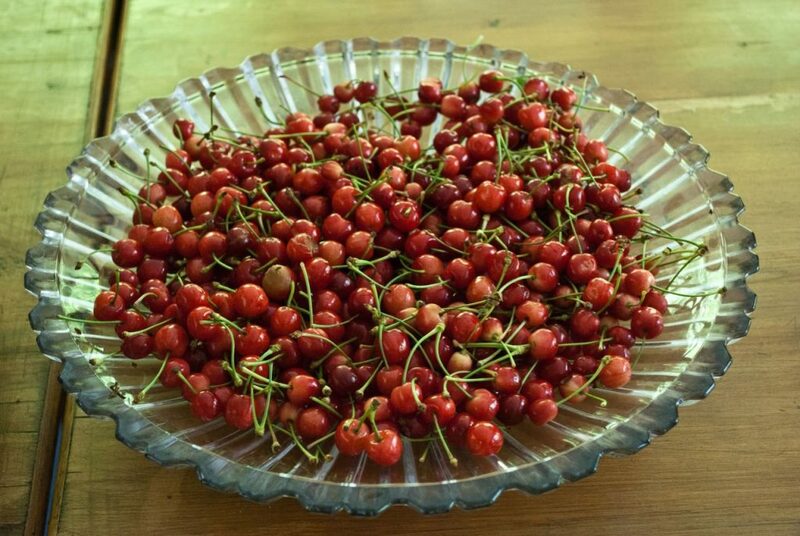 Want some fresh berries from Tirthan Valley? When I started visiting back in 2010, there were only a handful of places to stay in Tirthan Valley as people hardly knew about it. Over the last decade, there has been a massive increase in tourist footprints and hence, the demands for stay options too in Tirthan / Banjar region too. There are budget options as well as luxury options available now in Tirthan Valley and Jibhi region. Many homestays in Tirthan have also mushroomed in recent years and you can surely land up there to find few options for yourself. This if govt. run forest guest house and probably one of the budget places to stay in Tirthan. It will be a good option to stay with moderate comfort, if possible to get its booking or availability. If you really want peace, nature, romance, seclusion, and natural beauty then I will suggest you head for Tirthan Valley and perhaps even stay at Raju’s Cottage, Goshaini, Tirthan Valley – A Pioneer in Hospitality. You can contact them at 09418149808 (01903-225008 not sure of this one if it is working or not). It is extremely famous with tempting food as per the majority of people who stay there. It is surely the best place to stay in Tirthan Valley. It is right in the middle of the valley in Gushaini village and there are tons of nature walks or hikes around it which you can go for when required to feel further close to nature. The one word which in which I could describe experience and hospitality is “Awesome”. 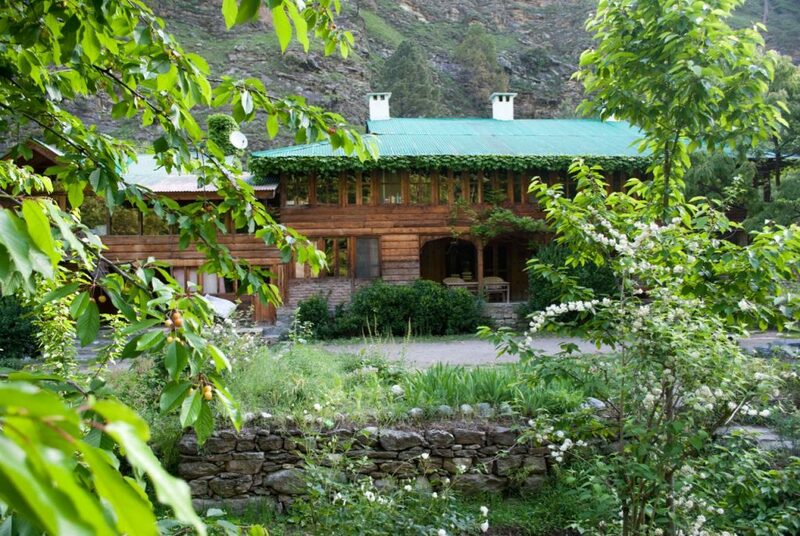 The Himalayan Trout house is located in the Nagani village just 2-3 km before Raju’s Guest House and 2-3 Kms after the Himalayan River Side Resort. Check the link for detailed review of it. This one is right at the banks of the river has got a lot of attention in the last decade. The price range is pretty decent and being adjacent to riverside, it feels wonderful to stay at this place. My own stay over here has been quite great when we could not get Raju’s Cottage booking. A little away from Tirthan at Ghiyagi village before Shoja. They have named it Shringipur now. It is a homestay kind of budget accommodation in Tirthan but with nice service and reputation. The river is a little hike down and this guest house is a bit away from main Tirthan (about 10 odd KMs, if I am not wrong). They have built their own little waterfall from the stream and have swings for the kids too in the garden. Well, if you are looking out to plan a honeymoon trip to Himachal, then maybe stay with Raju’s Cottage, Goshaini in Tirthan Valley. There is least tourist rush in Tirthan Valley and ample of peace and privacy which anyone wants on a honeymoon or any other rejuvenating vacation. Raju Bharti Cottage is the pioneer in that region and many times Outlook Traveler has ranked his place among top places to stay in the world. Quality, service, hospitality, and the location are just superb right amidst the lap of mother nature. You may ask him for offseason or honeymoon discounts too, if applicable. Advanced booking (in a months time) is must here. The raw nature is so close to the place, in fact, all around it. Tirthan River, GHNP, Flora, Fauna, Waterfalls, etc.. It will match a forest resort stay any day. There are other accommodation options too in Tirthan Valley viz. Riverside resort, Sai Ropa forest rest house, Himalayan Trout House, Shringi Vatika at Ghiyagi a little away from Tirthan, etc. which you can choose for a stay apart from Raju’s Cottage. Shoja and Jalori Pass are only 1.5-2 Hrs of a drive. A place where you can enjoy tons of snow in winters. I am not sure if the walk/hike to Seroloskar Lake will be possible in extreme winters or not from Jalori Pass due to snow. But, you can always check with Raju for the same before leaving. If you prefer peace and want to avoid mad tourist rush then it is better to avoid Manali during summer holidays, Durga Puja holidays and Christmas – New Year week when people from all over flock this valley. I hope above reasons or pointers are enough to help you decide why to choose Tirthan Valley as your honeymoon destination in Himachal Pradesh. There are eating options available as dhabhas in villages of Tirthan and in the main market of Banjar town. Otherwise, you will mostly be eating with guest houses or hotels you will be staying with. If you are on a day’s excursion to Jalori Pass, then you can stop at Shringi Vatika for a meal. There is an ATM at Banjar town. But, It’s better to carry enough cash. There are ATM’s available in Mandi and Kullu which are nearby, where you can withdraw money as well. Tirthan does have decent mobile phone network connections coverage. BSNL, Airtel, Vodafone and Jio networks are available, however, at times, they may have intermittent connectivity. On the trails in GHNP, you’ll be hard pressed to get a mobile phone connection. But, isn’t that the point of a trek or hike, anyway? Disconnect from the modern world, Y’all. 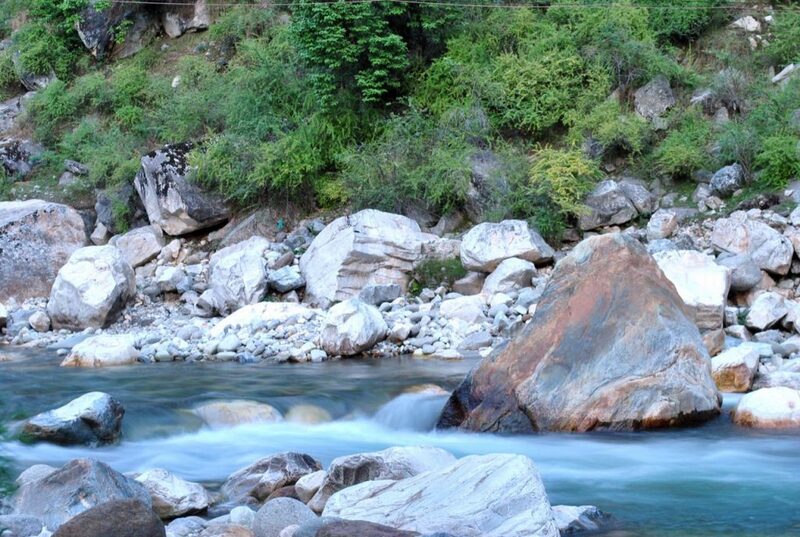 Tirthan is all famous for Trout Fishing and is also called Trout Fishing Valley of Himachal. So, you can carry stuff for fishing. The destination is ideal for anything that makes you feel relax from the day to day life, so go and enjoy to the fullest. Do not forget to refer my list of things to carry on a trekking trip. Always carry a water bottle as you will need it on your day hikes or other Tirthan Valley treks. Always carry a light woolen sweater/jacket for a winter trip. In winters, carry at least 2-3 layers of thermal clothing as temperature drops in negative in January. So we have talked in length about the positives of visiting Tirthan from Manali or Delhi. But, once you reach what should you do at Tirthan? or what are the tourist attractions in Tirthan Valley? Let’s look at some of the major attractions or things to do, one by one. As Tirthan is the portal to GHNP, you can go for treks or hikes or evening camping in the wild on your trip. You can get the feel of nature by walking or hiking in it till the inner entrance and then permissions are required for the entrance on a daily basis if you wish to hike deeper into it. A fun place to hike with family or friends. 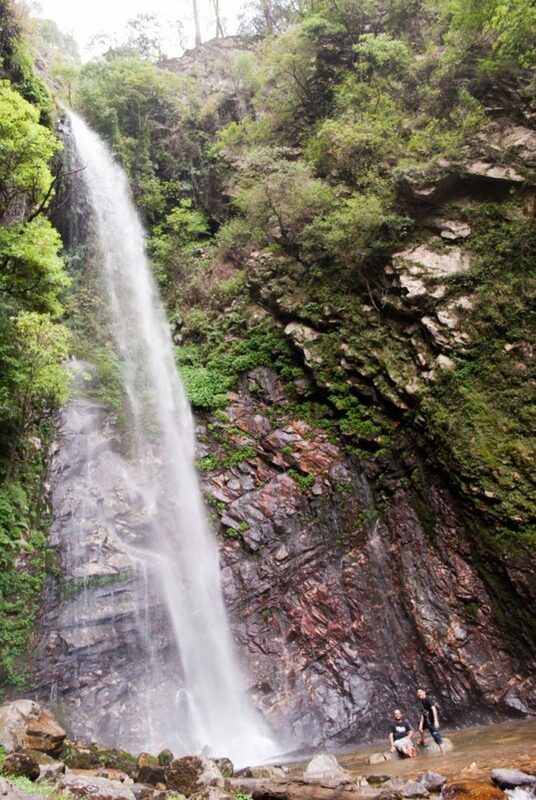 There are two lonely waterfalls around an hour of hiking distance with higher one being more than 50 feet high. Both of them are very closely separated from each other. 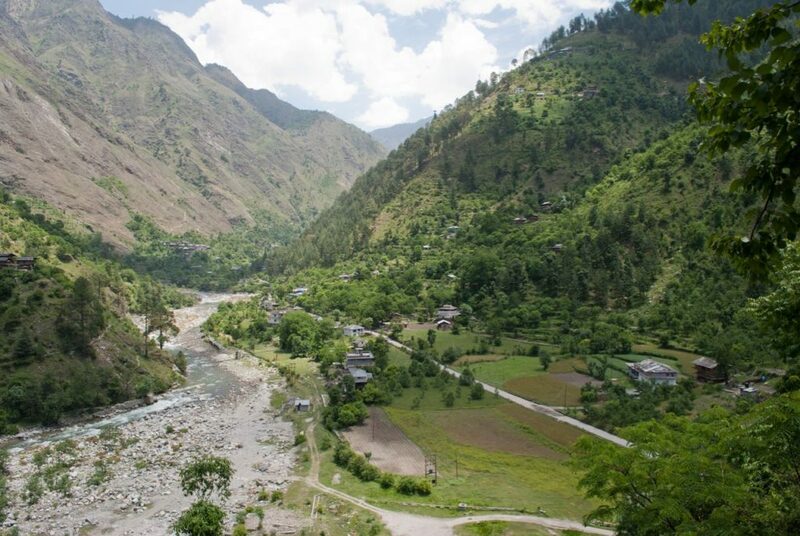 The aerial views of Tirthan from the trek to the waterfall are breathtaking. Jalori Pass, at an altitude of 3120 meters, is one of the steepest passes to drive in Himachal and it separates Kullu valley and Shimla Valley. You need to cover almost 2500 meters in less than 25 KMs to reach the top. The gradient is very steep and caution is required to climb up and down. Make sure you use low gear braking else you may end up with brake failures. You can have a meal at Shringi Vatika on the way back to Tirthan. Well, Jalori Pass remains covered with snow from December end till March end. So, the road ahead of Shoja and sometimes to Shoja is also closed in winters. Serloskar lake trek starts from Jalori Pass and the lake is about 5 km from Jalori pass. It will take about a couple of hrs to reach the lake and a couple of hrs to return back to Jalori. Hence, plan the hike to the lake and your day accordingly else you might end up doing night driving. At times, the lake might be disappointing. Do not forget to carry a water bottle along with you. This trek is also referred to as Jalori Pass trek at times. About 15 km en route Bathaad village, you can also visit this lonely pass from Tirthan Valley. Bachelo Pass also remains well covered with snow from December to February. Hence, you will not be able to too visit it in winters. Does it snow in Tirthan Valley? Yes, at times, it does snow in Tirthan Valley in winter months of January and February. Apart from that when you travel a little up towards Shoja and Jalori Pass, you will get plenty of snow as well as snowfall up there. How far is Tirthan valley from Manali? The distance from Manali to Tirthan Valley is 100 km and it will take about 3-3.5 hrs to reach Tirthan from Manali. Tirthan Valley is an offbeat place in Himachal Pradesh, still. It offers everything to every age group and a trip at any time right in the lap of mother nature is always full of warmth. 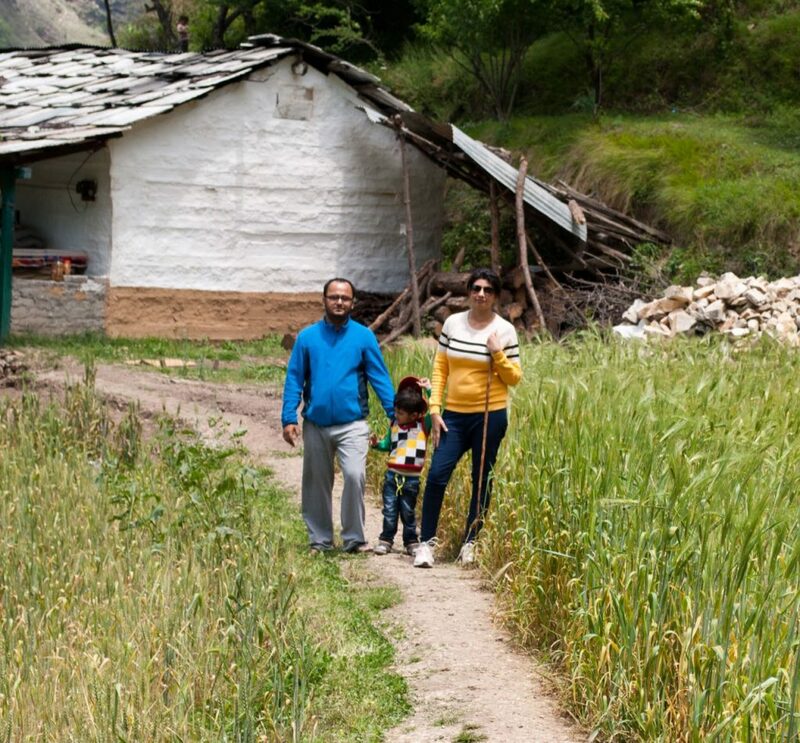 Whenever I am unable to decide on a trip, I pack my bags with my family and head over for a trip to Tirthan Valley to enjoy peace and calmness nature has to offer. PS: With this comprehensive guide, I am sure you do not need to buy any Tirthan Valley trek packages and the money you will save, you can spread some smiles in the Himalayas. I hope this blog article will help you plan your trip to Tirthan Valley. Do you have any other questions regarding this trip? Drop them in the comments below and we’ll try to help you in every way possible. If you like this article, then share it with your friends who you think might be interested in going to this offbeat place of Himachal! Wow! what a best place to hang up. Thanks for providing this informative blog and the proposed itinerary. First of all thanks for the above information. Thank you Dheeraj. Very helpful. Thank you for such an informative blog. Can you please suggest some offbeat and unxlored places near Delhi to sit and relax, enjoy The Himalayas for a 3 day trip in September. Hi, I am planning on visiting Tirthan this weekend. Will it be feasible over a car? What do I need to be prepared for? You can travel to Tirthan Valley, nothing much to prepare for it as the roads are almost fine barring few patches here and there. Go with woolens and thermals. Hello, I read your this blog as well as Raju Bharti one. Both are pretty informative. Great work, thanks for putting all information together. We (My, my wife, 2-year baby, parents and my sister) are traveling to Himachal on 16Nov to 1st Dec and here is my plan but it can change so please suggest me if you have any suggestion. We are planning to hire an Innova for all 15days. I am still deciding if I should leave Innova 23rd nov when we reached to Raju Bharti homestay and skip Kufri and stay for 6 nights there but I am not sure how will we visit Great Himalayan National Park, Jalori Pass, seolsar lake, Chehni Kothi Village etc. and how will we back from Tirthan to Delhi. Thank you Rishi and sorry for the delay in reply. I will suggest adding one day at Prashar lake else it could be a bit tiring and reduce the day from Manali. Rest looks OK. Do not expect much from Kufri rather stay a bit away from it. Nice piece. Going Jibhi from Delhi … with my family (wife and 4 year old kid) during the 12th August long weekend. Taking my car. – How is the road condition? Best wishes for the trip !! Me and my few friends are planning to visit Tirthan Valley end of July. Could you please advise if this is the right time to go there and for a trek? I dnt want to stuck in heavy rains or landslides so If you could advise. Bharti, best will be to check the rain predictions and then plan the trip. When it starts to rain, the river also get swollen and the charm of staying nearby river goes away !! You posts are really informative. I Wanted to go to tirthan valley, barot , bir billing starting 1st week of july. I will be doing this on bike. Is bike fine for this trip and can you suggest me itinerary starting from Gurgaon covering these places. Also if u can add a place or two that will be great. Thanks for your inputs, I will plan accordingly. I had one more query, where can I do camping in these locations? Well, camping can be done anywhere you find an open and safe spot. Best will be to negotiate with some guest house or dhabha or home stay to allow you in their vicinity so as to have a sense of protection as well. Hi, lovely write up. Informative and precise. We are planning to leave tomorrow night at around 10 for tirthan. We would be staying at nature’s lap resort. Need your advice on the road conditions and review on the resort if possible. Czar, no idea about the resort but road conditions are more or less fine barring a couple of patches of bad roads. We are planning to leave Delhi at 9pm in the night for Tirthan Valley. Not sure about the road conditions these days. Do you recommend travelling in the night? We will be driving our own car. Debal, road conditions are more or less good barring few patches here and there and some bad sections of truck traffic/potholes between Kiratpur – Swarghat – Bilaspur section. You may be late for now for Tirthan Valley for bookings at good places in Tirthan but if you have about 6-7 days from Shimla/Delhi you can surely visit Kinnaur Valley and enjoy nature at its best in summers. How many days you have in hand and how are you planning to travel? First of all Kudos for write for sharing your experiences. All of this is very helpful. Coming to my question, I will be in Tirthan Valley for 1.5 days ( 2 nights). Now, as I understand it, The Great Himalayan National Park is divided into eco zone and the core zone. I don’t like just rushing through a place. I like walking on foot and if i like a place I can sit at that point for hours altogether, enjoying my photography and being under stars . What advise would you give me for 1.5 days ( 2 nights) ? I will surely suggest you take a local guide with you, go up there for a couple of days, camp overnight, soak in nature and come back. In case you are staying with some guest house, they should be able arrange a local/guide to accompany you for it. The article is well written and very informative. We are just people planning to visit Tirthan in the coming long weekend. 1. How can we get to Tirthan from there? 2. Is the place safe for two females? 3. What is approx budget of the trip if one wants to try out adventure activities, fishing and a small trek. 4. How is the local transportation like? 1. You can either get down at bhunter and get a taxi from there OR you can arrange a pickup by asking your hotel to send the taxi, preferable. 2. Yeah, most places in Himalayas are safe unless you are the unlucky one. 3. Around 8K for 3-4 days trip. HI DHEERAJ SHARMA THIS BLOG IS REALLY NARRATIVE IN DETAILS ABOUT THE THINGS TO DO IN TIRTHAN VALLEY,,. 1) IS IT ADVISABLE TO TAKE A CAB FROM KATRA TO TIRTHAN & THAN DROP AT CHANDIGARH/DELHI OR TAKE ONE WAY CAB THAN GO TO DELHI FROM AUT BY VOLVO….IF CAB IS GOOD OPTION THAN ANY GOOD CABE DRIVER CONTACT NO U HAVE ? 3) SHOULD WE BOOK THE ROOMS IN TIRTHAN DIRECTLY ? ALSO FOR JOURNEY TO DELHI /CHANDIGARH SOME STAY IN BETWEEN…. PLSE HELP US TO PLAN THIS TOUR & MAKE IT A MEMORABLE & COMFORTABLE ONE…. 1. I will prefer a drop to Tirthan and then take the volvo back home. 4. 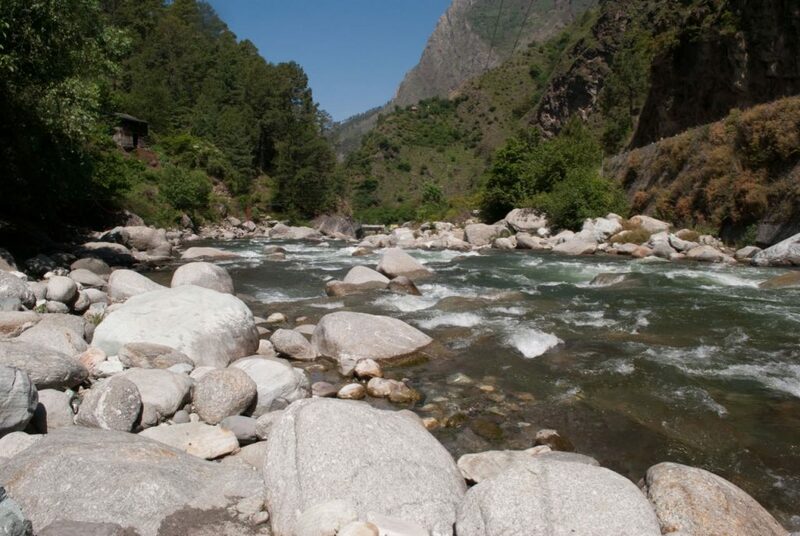 You can plan the day trip to Manikaran, easily. No Mukesh, sorry on that front. Best will be to get taxi from Katra / Jammu itself. There might be some buses running between Chandigarh and Katra/Jammu. Thanks a lot for this apt and informative piece. I wish to visit Tirthan Valley and The Great Himalayan National Park in mid Jan. Would like to know if you have any clue about how accessible the place is during that time? Also, if you could help me out with the places that will be open for stays? Tirthan Valley will be open all round the year and so as most parts of Great Himalayan National Park as well. SHowever, longer treks in it will not be open or recommended. We a group of 4 ppl are planning to visit tirthan in Mid of Nov for 03 days ie Sat morning reaching at tirthan n Monday by noon leaving for Delhi. 1. You have already selected mid of November. Nothing much changes between end and mid with mid Nov being a bit less chilly. 2. I will suggest to relax and take walks in Great Himalayan National Park when you are in Tirthan. Madhavi, I mostly avoid going to any place in mountains near the river in monsoons as most rivers flow above danger mark and can cause hassles at any day in monsoons. I will better suggest some high place in mountains and keep Tirthan Valley when rains reside so that you can enjoy it as well. Do you think it will be a good time to visit Tirthan considering the monsoons ? Arjun, I personally, in general avoid going to places with rivers near by in monsoons. 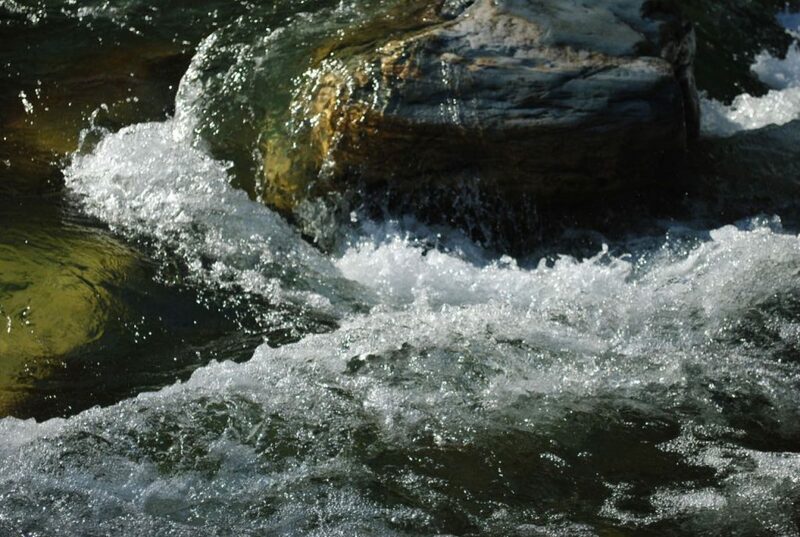 Most rivers are in spate during monsoons time and flow above danger marks. This year monsoon is less but still I will suggest that you check with a hotel/guest house in Tirthan who will be able to better guide on the ground reality. Thanks a ton Dheeraj, but can you also suggest some higher altitude places near Tirthan where we can plan our stay and travel easily to Tirthan as we’ll be having bikes on us. Hmm, in that case travel to Jalori Pass, Shoja from Narkanda side. Then, try to visit Tirthan from there (less than a couple of hrs drive) and then decide if there is no rains in those days may be stay in Tirthan only. Still, make a call considering the weather conditions in hills. We plan to go to Tirthan valley around 29th Jul for 3-4 days. Just need time off from routine. We have 3 yrs. old daughter. Hope it will not be too hectic for her. Is it ok to go during this time? And hopefully we will not get caught into heavy rains/bad weather. Kindly suggest if we need to replan this trip for some other time. Just check the weather conditions during that time. Actually tirthan is all along the river, so in case of bad weather river will be flowing in spate !! So, you should travel to some high up place in monsoons where at least river is not around. 1. How are the roads and traffic ? 2. How much time will it take ? Can it be done in one day without exhausting too much ? 3. Is the car parking you mentioned. In the article safe ? Me and my friend,both of us are planning a trip to Tirthan Valley in second week of July. Is it the right time to visit the place..or the monsoon has already set in. Yes Shilpa, it will be a OK time to visit Tirthan Valley as mostly rains are delayed now a days. However, if there are rains, well you feel a bit disappointed. we have booked at himalayan trout house for four days. we have baby of year n three months old with us. could you suggest us some easy trek or birding pockets. (we are avid birders). we cannot take strenous treks as we will be carrying baby also. if there are any motorable places for birding that would b great. later, we are staying at kasol for few days. again, if there are any suggestions for points or pockets that could b explored do tell. I am looking for Bus booking via HPTDC online site but can’t find AUT as destination from DEL. Can you please advise. below are the only available option in HPTDC site. I planed to visit Tirthan Valley, Himachal Pradesh in last week of june, i already booked 3 day stay with raju guest house, can you suggest some near by place to visit during my stay, we have 8 family member (incl my mother aged 70 plus). also suggest how to get Volvo ot other way of transposrt from AUT to delhi . Sanjay, just relax over there, enjoyii the river and walks in the Great Himalayan National Park or hike to the waterfall. Varun should be able to arrange permits for you. Thanks for this wonderful website and the guidance you provide to all seeking tips and advice! I request your help in planning an itinerary for my family vacation. We are a family of 5, 3 adults (Couple plus mom who is 72) and 2 kids (15 and 6). We are traveling from Mumbai and would like to set a trip of 8 days in HP. Since I am on a budget tour we are doing Mum-Del by train and will be staying overnight in Delhi so that we are ready to start early morning from Delhi next day. The idea is to not travel too much as we have our Mom with us. we just want to stay at 1 place and visit off-beat attractions nearby. We are okay to just laze by a river with views of the Himalayas, walk in the woods , camp for a night and in general enjoy nature. Please recommend an itinerary for either of the destination options above. also is it a good idea to hire private car for journey from Delhi or Volvos are better and safer? Also is it better to travel from delhi to destination overnight or during the day? Best is that you visit Tirthan Valley. It is one amazing place where you do not even get bored staying for long days. My itinerary is like – Shimla(1N) – Manali (2N) – Tirthan valley(1N) – Chandigarh. Which one will be best Shoja OR Banjar ? Could you please let me know should I get any bus from here to Chandigarh/Kalka. ? I am looking for a place that give beautiful mountain view and river as well. So which one will be good, Banjar, Shoja or Jibhi? Yes, you should be able to get bus to Chandigarh as well as Shimla/Kalka, may be connecting buses they might be. Shoja does not have river access, you may try Jibhi and Banjar is a town. 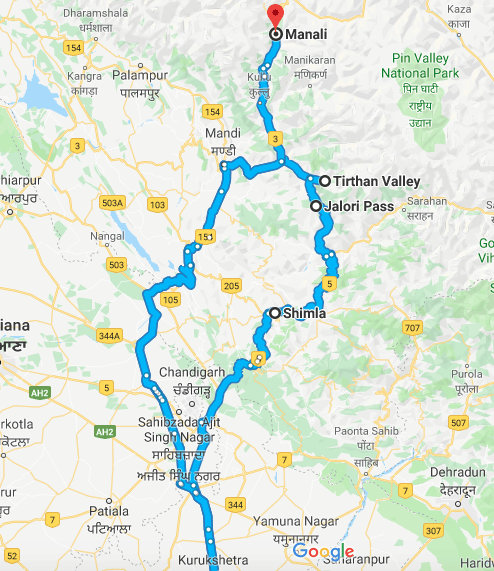 Leaving for Trithan valley this Saturday for a week and need a quick guidance, we will be travelling by volvo till Aut and then local taxis/ hitch hiking the entire trip. As of now we plan to spend 3 full days in Trithan and then go to Jalori pass and do the lake trek. (is it possible to camp overnight at the lake or we need to come down to Jalori pass for overnight halt). Also we intend to do camping at Parashar lake. Beside these locations can you suggest some very off beat places that we can built in the itinerary. Have no intention of going anywhere remotely close to Shimla, also a no no to narkanda chail kasauli mashobra kufri etc. Can Malana Tosh be included in it, i know it is in another direction from Jalori? Any other destination which is travelers paradise? Chitra, if you are are carrying tents, you can do so but I am nost sure about the permissions. Check at Jalori camps for it. Prashar does have camping option but again you have to carry your own camp. How many days do you have in hand?? Q1. Which trek can we do on 26th Feb ? I heard there would be snow around this time so trek wont be possible. Q2. After reaching above (from the trek you suggest), we want to stay on the top for a night. Any suggestions for that ? We heard because of snow, there will not be any water available. Do people do trek in feb ? Is it safe ? We want to come back to Delhi by 28th evening. Thanks in advance Dheeraj ! 2. Staying overnight will not be possible or recommended in this weather unless you have experience of camping in cold conditions. Also, wild animals come down too in winters from high altitude to find food, so that is a risk too. People do not undertake long treks usually in winters unless they are well quipped and experienced with it. Highly appreciate such quick reply Dheeraj sir ! We are very very less into trekking, so your suggestion well noted. We won’t take long treks but do some lower day trek in Great Himalayan National Park only. Can you suggest some or we can ask from locals there in tirthan ? Or do you suggest if we should try going to Kasol (or some other place you suggest) on one of the day and directly come back from there to Delhi ? We all are under age group 24 to 29. Dheeraj, you can ask the locals once reaching there. Take a local with you, a guide or just a villager in Goshaini village will do for you. Both have equally good beauty Parvati Valley as well as Tirthan Valley. You will not go wrong with any of them. Would you advice to head for Tirthan in December? I am looking for a lone trip for around 10-15 days at peaceful places (not tourist destinations) in Himachal. Please advice. In case you do not mind cold conditions and basic food, I will suggest you spend that many days in Kinnaur Valley at Kalpa and Reckong Peo region along with Sarahan some days. If you wish to stay at Tirthan Valley and Barot that will be good options too with a split for 6-7 days at each of the place. We have been to Thirthan Valley on this Diwali weekend. Roopnagar ( 08:30 hrs) for breakfast and lunch at Sunder Nagar (13:30 hrs). Due to very next day of Diwali, very less traffic through out the journey, even in most notorious Bilaspur route. Road conditions very good, only around 10 KM stretch before Sunder Nagar is bed but manageable. Stayed at Khem Bharti Home stay (Hotel Trout Valley), Nagni. Because of off season got 10% discount. Returned via Jeori Pass. 10 KM before and after the pass not good as usual. Night halt at Narkanda. journey from Narkanda to Karnal was smooth on 15th Nov.15, after Karnal faced very heavy traffic & rush driving. Thank you for the update KB ji. Can you please share some info. on Khem Bharti Home stay. How was it, numbers and the price you paid? Any photos you would like to share? Khem Bharti Homestay is run by Mr. & Mrs. Khem Bharti. The location is 100 meter before Mr. Christopher’s Himalayan Trout House. Vehicle parking can be managed on the road side. He has total six double bedded rooms with attached bathroom. Two rooms at top floor are newly constructed and we stayed in one of that room. Rooms are very well maintained, very neat and clean, using solar panel for water heating. Tariff for rooms at top floor is Rs. 3500/- per day and these includes Breakfast, Lunch & Dinner. We were two adults with 11yrs old daughter. Hospitality of Mr. & Mrs. Khem Bharti was top class. Provided all sorts of help like hot water bag, room heater, Apricot oil for joint pain etc. Mrs. Khem Bharti was very friendly with my wife & were gossiping for long time after dinner. First day dinner they served us lamb meat and on second day Trout fish without additional money. We paid Rs. 6000/- for two days with 10% discount. He did not charge for extra person. With my personal experience, I highly recommend Hotel Trout Valley / Khem Bharti Homestay, Nagni at Tirthan Valley. Thank you so much KB ji for a detailed review. If we plan to choose bus as the means of transport. How do we get back to Delhi from Tirthan? What time bus runs from tirthan/aut, which bus service and from which location? Also do we have bus services available at night around 10 from Delhi? and which service if so? I think only standard buses will be available only around that time because last Manali – Delhi volvo will be around 8-9 only. Check HPTDC or HRTC Websites only. Shruti, you can catch the volvo from Bhuntar. Volvo runs between Manali – Delhi and from Tirthan you can either get a shared jeep, bus or private taxi to reach to Bhuntar or Aut tunnel entrance and tell the Manali – Delhi volvo guys your pickup point. You will get the service from there. We are planning a weekend trip to Gushaini on the 29th of October. We plan to start by 1 pm from Delhi and reach by 8-9pm in the night. Next day morning we want to go to jalori pass and trek to sirloskar lake. On 31st we just plan to chill and drive to the nearby places or maybe do some fishing. Is this plan a good one? Please advise on this. We really want to see sirloskar lake and jalori pass and also stay at Raju Cottage. Pranay, it will take 14 Hrs to reach Tirthan from Delhi. So, you need to work out a plan a bit. How many days do you have? Pranay, you can take overnight volvo to reach Aut in morning and then a taxi to reach Tirthan, spend a day there and then take overnight volvo next evening to reach back to Delhi in monring. Sir one last question, where are some good camp sites in Tirthan? we are thinking of taking our own tents. Pranay, you might not get the open camp site in Tirthan. However, you can ask couple of home stays or guest houses that they allow you to pitch the camps in their grasslands or farms. It will give you a sense of security as well. In the last you can pay a little tip to them and that shall be all. Very impressed by this article. My friends and me are planning to go to Trithan Valley for a weekend. We will be setting off on Thursday and want to return back till Sunday night or Monday Morning. Can you please suggest us a good itinerary for the same? A bit of trekking included in this would be so delightful. Is it possible to? Thank you Lakshay. You should just reach Tirthan Valley, spend the days you have in hand up there exploring waterfall or a short hike in Great Himalayan National Park. Then come back home. I ,my wife & 2 children are planning to see snow fall from 24 to 28 Dec.15 .Plz guide us about places. Thanks for such an informative blog and the proposed itinerary. I (with my wife) planning a trip to Tirthan valley this september end. Taken a week off, so have 9 days at hand. We will be self driving to Tirthan and on the way back I am thinking of the route through Narkanda, as you suggested. But since we have more days at hand we are thinking of taking a stop in both journeys. 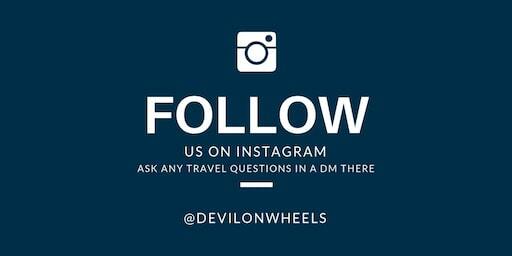 Can you suggest an itinerary we should follow (from Delhi)? Basically which are the right places to stay on the way. And what all we can cover in that region. We are planning to take “Shilt Hut” trek (for 3 days) there. 1. I am not sure it would be comfortable to drive straight to Tirthan, without stop. 2. We have already visited Narkanda (Hatu peak) and Chail some time back, so not very much interested in repeating those places. What do you think if we make below changes. Looks good to me. You can actually drive to Chail or Shimla from Jalori as Narkanda will be to close to Jalori without much to do as you have already visited the place before. I am planning to visit Jibhi on 19th Sept from Shimla with my wife and 7 year old son. I will hire a car from Shimla and visit Jibhi (stay at Dev Conifer) and move to Naggar and Manali on 20th Sept. I hope the road at Jalori pass can be travelled in a small car. Please let me know your thoughts. Yes Ajit, since you will be hiring a local taxi, it shall be fine to travel even in small car as these guys know how to drive over that terrain. Just confirm if the driver has done the Jalori Pass or not in past. Thanks, drivers name is gopal singh Thakur from Shimla. Spoke to him and he confirmed he has driven the jibhi-jalori pass terrain before. Good to know that Ajit, go ahead in that case 🙂 … You can update his number in the thread in community in case you like his services. Hamza, best will be that you head to Manali and see snow towards Manali Rohtang Pass during that period of time. Do you traveling in July mid is appropriate to this location. We do not want to drive and would prefer taking a bus. Any other similar places apt to travel in July mid considering it would be the rainy season. Also could you suggest some hotels. Aishwarya, it will be much better that you plan a trip to some high place, something like Shoja which is near to Tirthan Valley or may be Chindi near Karsog. Since it will be rainy, the rivers will be swollen so chances are you might not enjoy the serenity. So, better make a trip to Shoja or Chindi in monsoons. In case it is not raining during the days of your visit, you can easily go down to Tirthan Valley and stay for couple of days in such a case. We are planning for a road trip by car , we have 5 days. Please suggest. Where we can get snow caped peaks ? I will go with Tirthan Valley during that time of the year. First of all thanks for the above information. It really helped us a lot in planning. Now we are thinking to take a bike trip from Shimla to jalori pass to tirthan valley. We are not experts with bikes. so , would u please tell me the road condition of this route and which bike should be preferred for this route. I just want to ensure that we must have a safe journey..
Deepesh, the road conditions are fine to Jalori pass but it is steep, so drive carefully and also use gear braking by riding in low gears and never with ignition off bikes. If you use too much brakes there the chances of burning the brake pads are high. thank you so much for your answer. would you please tell me the approximate distance of steep road and from where to where is the road steep..??.. also inform me is there any convenience to go in that steep road or the bike will be fine……? ?